Liven up the house, or make a unique gift with a set of our gorgeous personalized coasters with no minimum. Simply upload your photos and designs to create your own set of custom coasters. Use the same image or have a different image per coaster. Add message too if you wish to make your own photo coasters with pictures and words. Create picture coasters fast, they are easy and fun to design. Our beautiful customized coasters are great additions to the household or also make awesome gifts. Choose some of your best and favorite pictures and make your own coasters with photos. Add some text as well for an even more custom feel. You can easily create a set to match the decor in your home as they come in sets of 4 upwards. Or you can design a set of photo coasters for a friend or loved one as a wonderful gift. Design your own coasters in our easy to use tool. You can have fun designing each one thinking of what your loved one will adore. Take some of those crazy friend pictures or lovely family photos and make printed coasters so that the recipient can enjoy those memories anytime they want. The quality of the photo coasters is great! Will use BagsofLove again, without reservation. This is my first time ordering from Bags of Love and your company did a fantastic job! I love the products and it was a fast delivery! I am very pleased and would recommend your company to anyone interested in customizing fun gifts! I was extremely happy with the quality of the product and the clarity of the photos. The purchase was a gift and the recipient absolutely loved the coasters! What Will My Photo Coasters Actually Look Like? These are super high definition photo coasters, and the glossy sheen gives a perfect finish. Rounded edges make them safe for all the family, so they’re ideal gifts for kids too. Who Would Love a Set of Personalized Coasters? If your 5th wedding anniversary is approaching, these personalized wooden coasters are the perfect gift – wood is the traditional material for celebrating five years of marriage. 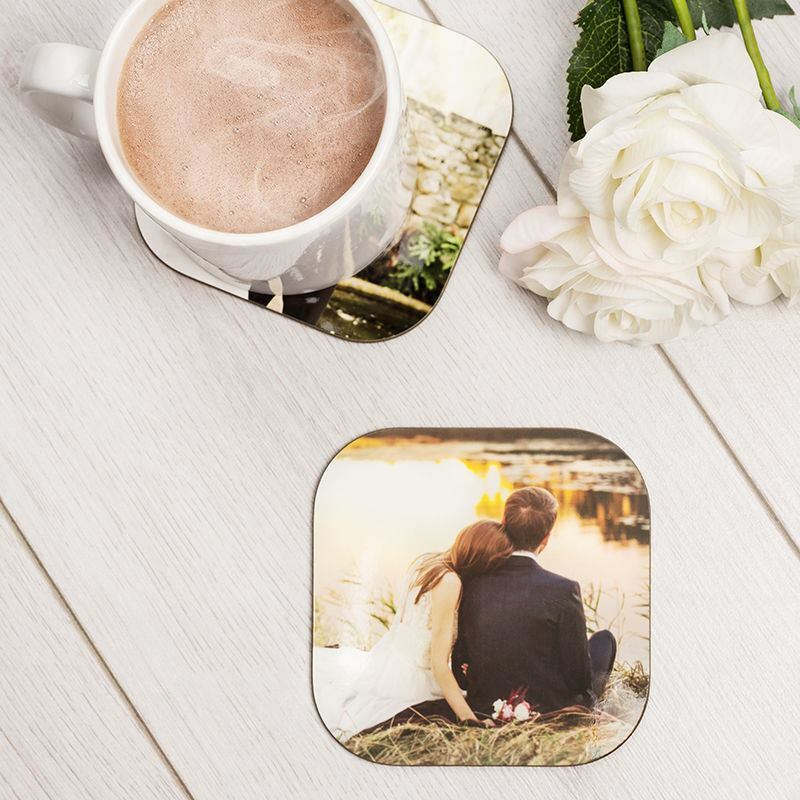 Give your husband or wife a set of photo coasters printed with your treasured memories from the past five years, or go back to where it all began with pictures of your wedding day. Our personalized coasters are a great housewarming gift, so for couples who are moving in together or families moving away to another city, make their new house a home with customized coasters designed by you. Your coasters are lovingly handmade to order. We print your photos using a specialist process to guarantee a long-lasting print. Your coasters are individually made so you can have a different photo on each to make a gorgeous personalized gift set. You can use your personal photos with text to customize your coasters for all the family, print each person's face and add their name underneath. You could print your own coasters using a unique graphic design. Choose the same or different photos. Surprise your partner with a bespoke wedding proposal using our personalized coasters. Choose a background design or color and print the magic four words ‘Will’ ‘You’ ‘Marry’ Me?’ on each one. Unlike a traditional proposal, this one will last forever. Design your own wedding coasters to use as quirky favors printed with each guest’s name and a thank you for their company, or create special ‘Bride’ and ‘Groom’ ones for the head table. Guests will love their personalized keepsake as it’s a reminder of the special day but also a practical gift they can use at home. It definitely beats the generic name placeholder. Design you and your family a set of personalized Christmas coasters. Great for the table at the famous family dinner, or for putting your Christmas morning hot chocolates while the presents are being opened. You could even create a Santa and reindeer coaster to use when you leave out the gifts on Christmas eve night. Make your own coasters for all the family so there’s no excuse for any cup ring stains. Print their names in a beautiful font on a custom background design, or make novelty coasters featuring a photo of you all pulling a funny face. Individual photo coasters are fun, practical and great last-minute gifts because we make and finish them on the same day!